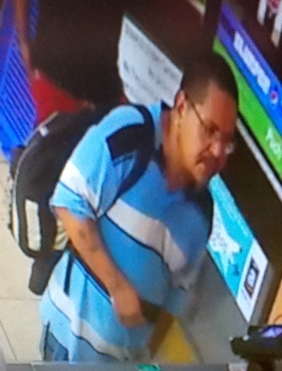 On June 20, 2017, the Dallas Police Department released a photograph of a person of interest related to a sexual assault that occurred on June 17, 2017, in the Deep Ellum area of Dallas. As a result of that broadcast, the Dallas Police Department received multiple tips which led to the identification of Roy Gutierrez, a 40-year-old Latin male. Detectives obtained a warrant for the arrest of Roy Gutierrez. At approximately 10:15 p.m. on June 20, 2017, Gutierrez was arrested at the DART West End Transfer Station in Downtown Dallas and has been charged with Aggravated Sexual Assault. He has been placed in the Dallas County Jail on $100,000 bond. The pictured subject is a person of interest wanted for questioning regarding a sexual assault offense that occurred late Saturday night, June 17, 2017, in the Deep Ellum area of Dallas. The subject is a Latin male approximately 5’6” tall and 210 pounds, with a mustache and a small goatee. The subject has tattoos on both arms and was wearing glasses. This offense is documented on case number 137656-2017.